1888:A Jack the Ripper Novel, is available to buy on Amazon now! Aside from those on Gina and Toby, the chapters I enjoyed writing most of all in 1888, were those based on another fictional creation of mine - Mrs. Sparrow. While the character of the fraudulent, agoraphobic Mrs. Sparrow may be my invention, she was inspired by the curious popularity of mediumship and Spiritualism that had grown in prominence in the later half of the 19th century. They were a sensation, and as news of their abilities spread, so did the popularity of spiritualism. Mediums sprouted up all across America, and it was not long until the United Kingdom would follow. 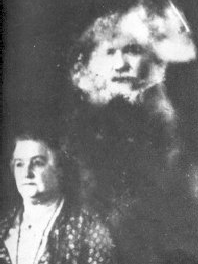 This era saw the invention of spirit photography- utilising tricks and double exposure to capture images of supposed ghosts for an audience who still regarded the camera as a little understood mystery. Nowadays, it is hard to look at these photographs and imagine how anyone was fooled, but the cynical age in which we live is far removed from Victorian times, where a naivety of new technology and a general trust of the good intentions of others, had not primed an audience for such subterfuge. The popularity of spiritualism and the reaction to it, can perhaps best be summarised by the lives of two of the most famous men to be born in the 19th century. Sir Arthur Conan Doyle and Harry Houdini. 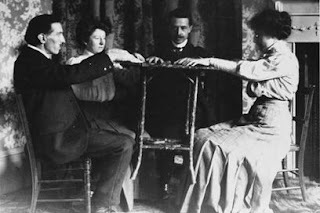 Conan Doyle was one of the most renowned and outspoken supporters of Spiritualism, though he only truly took to it in his later life; in the first decade of the 20th century, while the belief was at its most popular. Conan Doyle had lost his wife and many other members of his family in a short space of time and was desperately looking for answers. Upon discovering the claims of mediums to be able to channel the words of the dead, he embraced it completely, much to the shock of many of his friends and the public at large, with whom he had fostered a reputation as a fiercely rational thinker thanks to his invention of Sherlock Holmes. Houdini also found himself beguiled by the promises made by spiritualists following the death of his mother, to whom he was extremely close. After attending a seance, he was so horrified by the medium "channeling" the voice of his mother (in English, despite his mother only being able to speak Hungarian) that he vowed to expose fraudulent mediums across the world. While Houdini stopped believing in Spiritualism, he never gave up hope that he may have been wrong. Upon either one's death, he and his wife, Bess had established a secret code one would pass to the other as proof of an afterlife - a line from a play in which Bess had performed, "Rosabelle...Sweet Rosabelle, believe!" - after he died, Bess attended a seance every Halloween (the anniversary of his death) but never did hear the message from a medium. All of which may seem to be a long way from poor Mrs. Sparrow, confined to her tiny, narrow house on Commercial Road. However, all of the techniques used by Mrs. Sparrow, her sister and her daughter were genuinely in use at the time. The "talking cards" were an early precursor to the Ouija Board (invented and patented two years later,) while the broom, bell and candle were all methods exposed by Houdini. 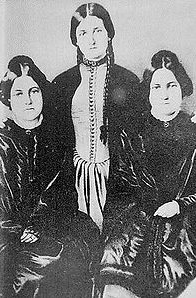 As for the Fox Sisters, it was that very same year of Jack the Ripper, that the two younger siblings announced to the world how they had fabricated their communications with the dead all those decades ago - using nothing more than an apple on a piece of strings that could be dropped to the floor to create the sound of knocking. While I enjoyed writing about Mrs. Sparrow, let it not be forgotten that she, like the Fox Sisters, like every supposed medium Houdini investigated, was a fraud and exploited the anxiety of death and the grief of others. When looking at their modern day counterparts, never forget that there is every reason to suspect that they may be lying too.